Yikes! I'm late to get this post out. I honestly didn't even think about posting for Bloom Day (the 15th) until I realized that I actually do have a few blooms in the garden. Spring *might* be early this year in the great Pacific Northwest. We've had a very mild January with two sunny weekends in a row. There's always the chance during this La Nina season that we could get a cold snap in early Februrary however unlikely as it feels. Here's how it looked with the hedge torn out. I think I gained 4+ feet of space to plant things I like! The old chain-link fence came out and a new, wooden fence was installed. 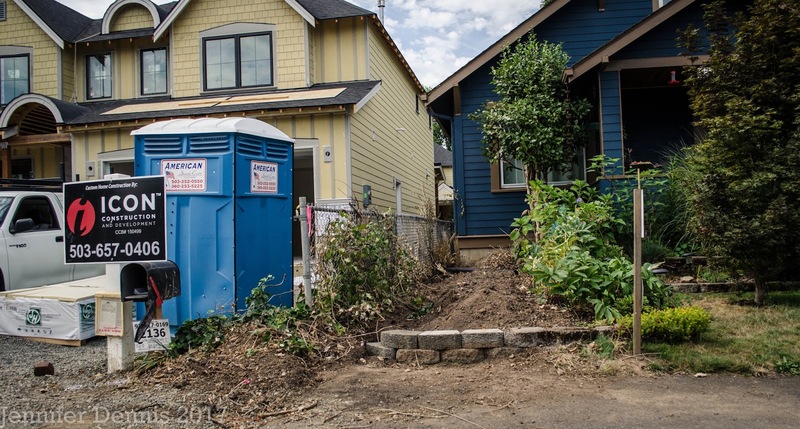 I expanded the stone retaining wall, filled in with dirt and then had a new space to plant. The old roots of the privet hedge were deep and quite hard to get out! The boys installing the fence helped hack them out. Front flower bed - Expanded! This space is looking much better now..even in the dead of winter. 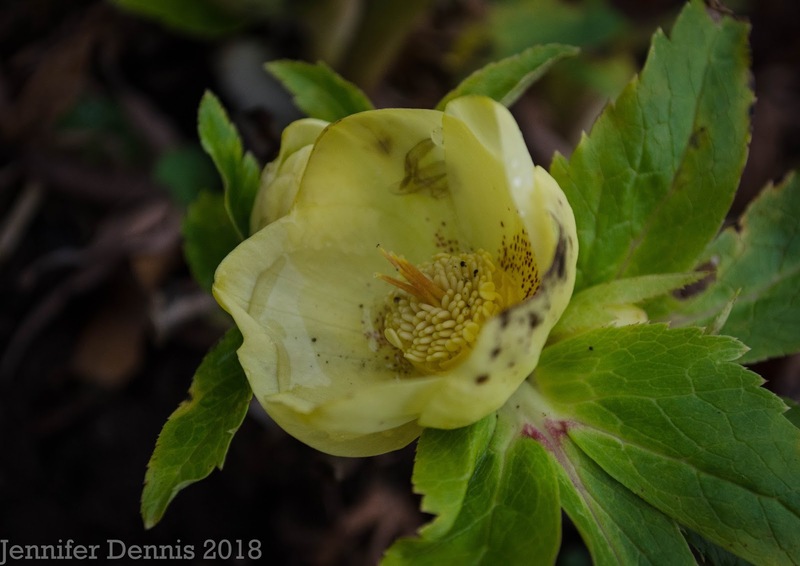 Clumps of transplanted hellebores are begining to pop up! In the back I have 3 honeysuckle vines and coneflowers, sedums and panicums planted for a summer show of color. I moved all of my hellebores to this space. I have 13 total and many had been in less than ideal spots in the past where their blooms were hidden and they were struggling to get enough summer water. I'm quite excited for this hellebore blooming season because I see that my hard work is already paying off. Blooms that I could not fully enjoy are beginning to open their pretty faces. 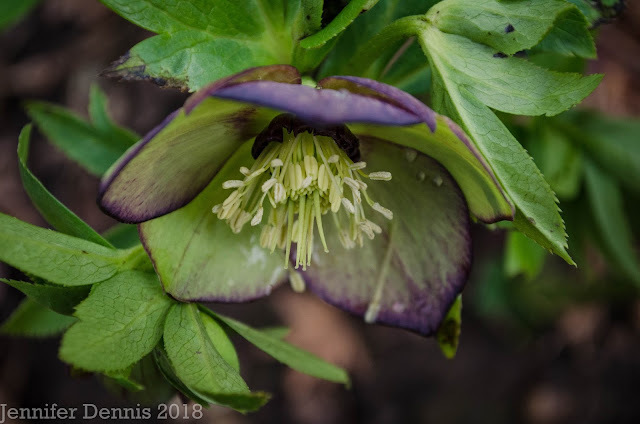 Currently blooming is Spring Promise helleborus 'Valerie'. It is has lime green colored petals with deep, purple, picottee edging. 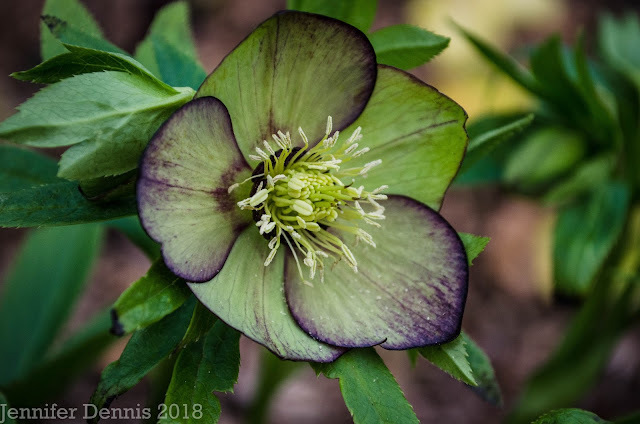 This is one of the first hellebore's that I purchased. I originally placed it near a rhododendron, which eventually grew over the top of it. I love being able to see the blooms now with ease. Spring Promise helleborus 'Elly' is the earliest bloomer of my collection. 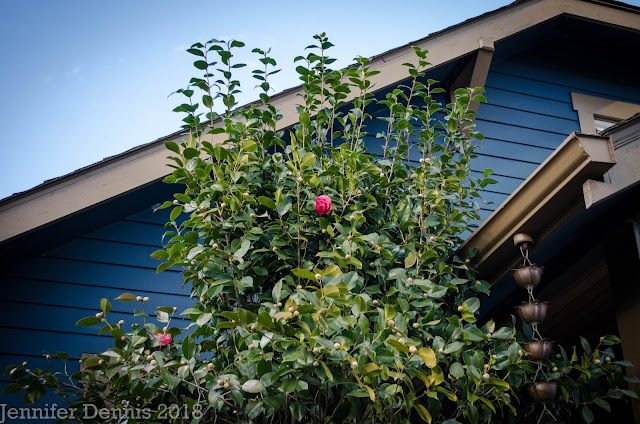 She started to bloom in November this year and is still opening up new, frilly and lightly painted blooms. And from the Winter Jewel's collection, 'Golden Sunrise' is beginning to open it's first bloom. I am looking forward to seeing more of this happy color. While it's not the best looking bloom per se, it's color! And in the middle of winter...it's exactly what I need. I have many plants from the 'Winter Jewels' collection. 'Golden Sunrise' is the first to try and bloom. I'm hoping that with their relocation to the new plant bed, they'll be happier and send up more blooms in the years to come. Another show of color in the front yard is my summer heath and it's turning a gorgeous shade of coral-pink. 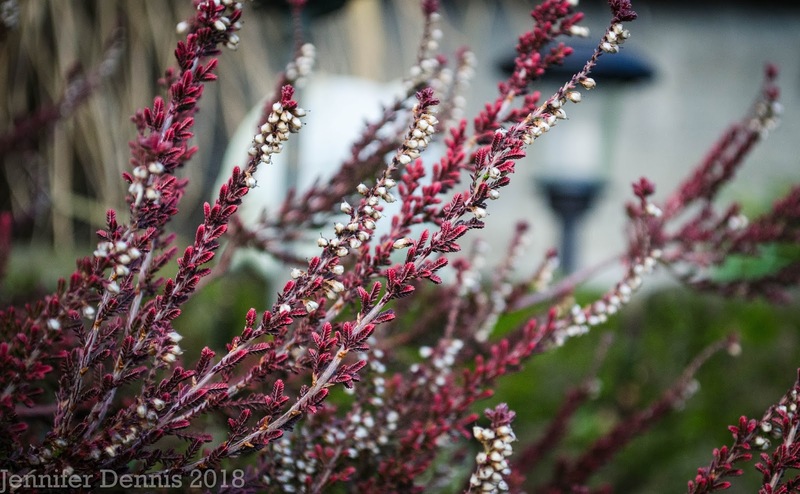 This is calluna vulgaris 'Firefly' and the foliage will change shades during different seasons. Oh look! Way up there...it's a pink dot! The heirloom camilla tree is blooming. There are a lot of buds on the tree and I'm hoping for a good bloom year. 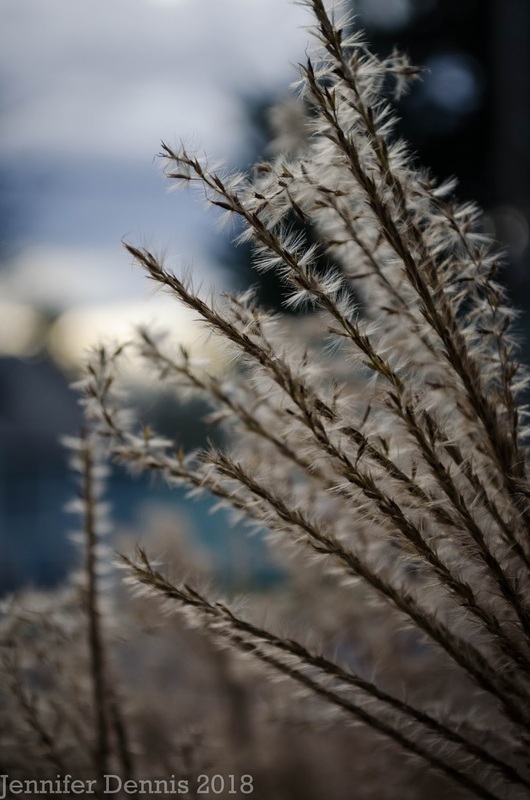 Miscanthus 'Morning light' still has plenty to offer in January. Pretty seed heads in winter. In the back of the house, my impulse purchase from last Februrary is blooming. 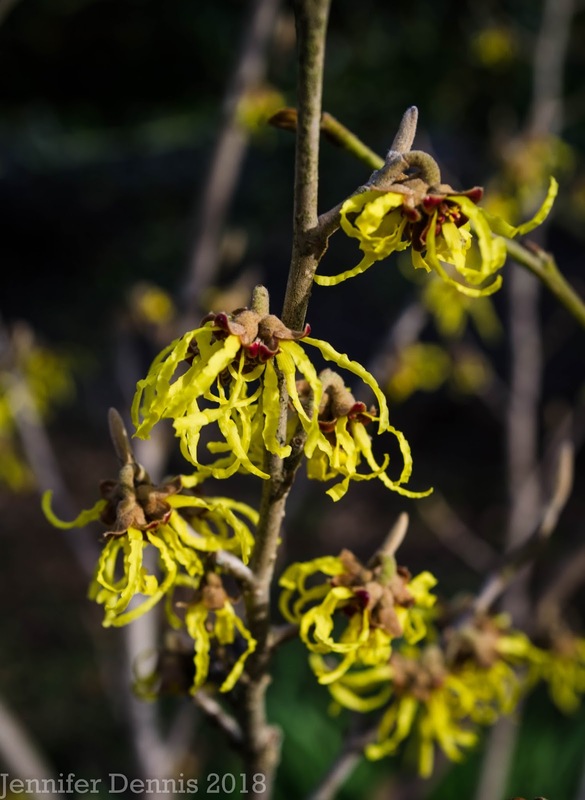 Witch hazel 'Arnold Promise' has a soft, subtle and sweet scent. I can't wait for it to grow larger and fill the backyard with it's lovely perfume. Silver cat isn't too impressed. 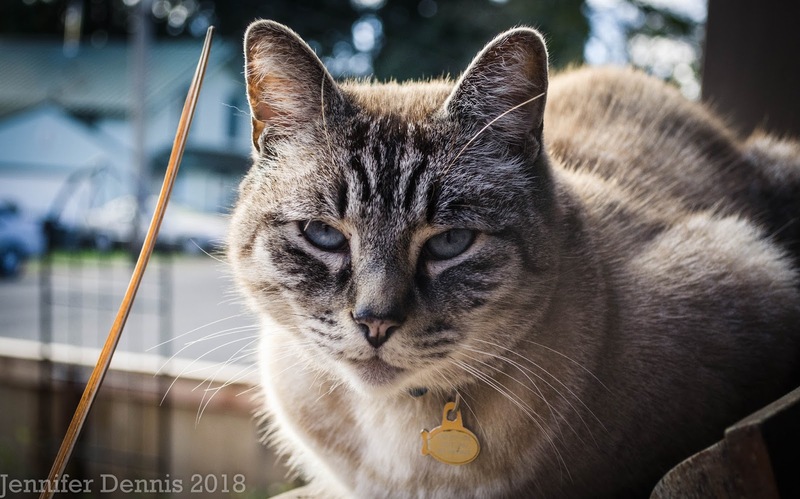 The king of the castle oversee's all from his perch on the front porch. Three cheers to Gardening in January! Thank you to Carol at May Dreams Garden for hosting Bloom Day on the 15th of every month. This January closes the 11th year this meme has been running. It's been a fun way to track changes in my garden, year to year. Wow! Taking out that hedge was a big project! It looks so much better. I know those Hellebores are much happier. What a lot of work to get the hedge out! The area looks very nice now and I love all your hellebores. Sorry about the new construction next door; the noise would be crazy-making. Hooray for new space to plant stuff. Your hellebores are way ahead of mine and are gorgeous! Hi Peter, I fully admit to not being at my best this year with all of the construction related noise and other drama. It's a hard thing to be subjected to. I'm looking forward to the hellebores finally getting a place to be the star of the show, as they should be. Front and center..ready to welcome spring! I think you will find that with the privet hedge gone and the nice fence up, you eventually will tune out the monstrosity on the other side and focus on what's in front of the fence. I have a similar situation with the duplex next door. 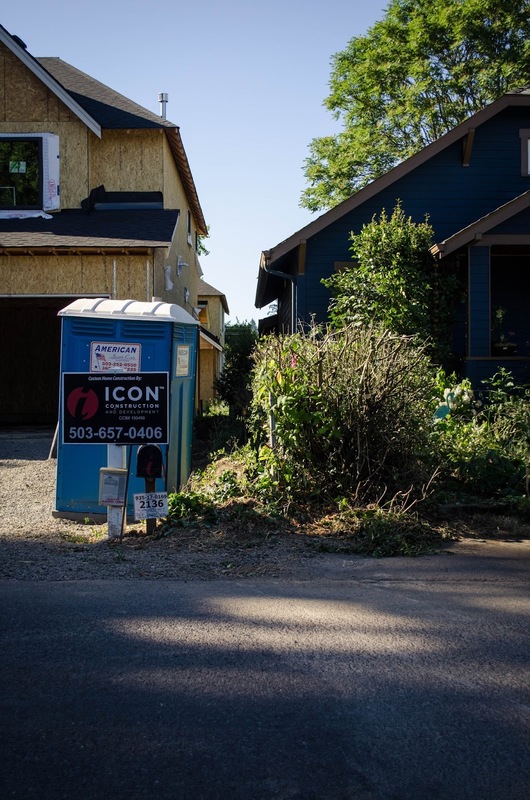 I have to admit, i'm liking the porta potty outside idea. Then I don't have to shed all my dirty clothes just to get to the bathroom. Matthew, you make a good point. When I visit your gardens, I know that duplex is there..but it's so tuned out as I have my eye focused on all the pretty things in your garden. I hope I'll be able to do the same in my yard. I'll tell you this...after 6+ months of smelling that awfully port-o-potty, I was thrilled to see it go. It was parked outside our bedroom window for much of the time. The builder was ever so considerate on 'sharing' the smells of that nasty thing. Not to worry Mark! I plan to put more time and attention into the existing veg plot in my back yard. It's been neglected, but I'm hoping to encourage my husband to play a larger role in the planning and maintenance of it should I continue coaching soccer! Don't you love it when you "find" space in the garden like that?! 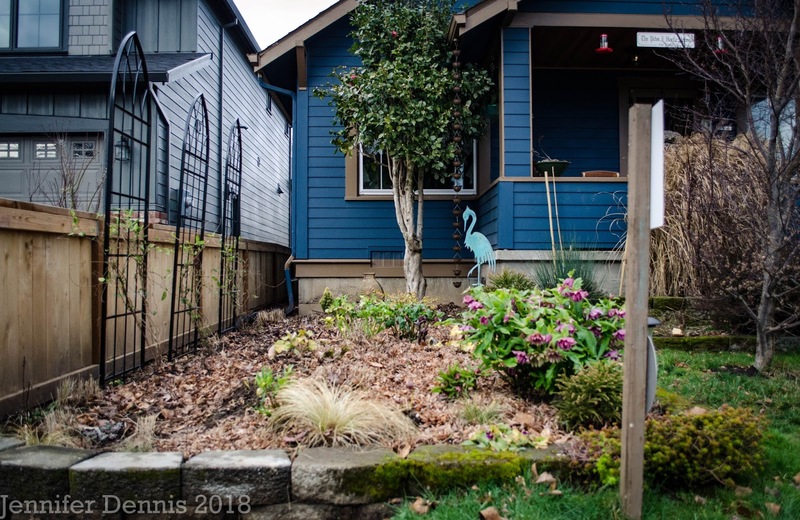 My husband and I took out a dying Ceanothus hedge (oddly placed only feet from another hedge by prior owners) and I got a huge space for succulents and, yes, more Leucadendrons. I love your hellebores. I've planted half a dozen but I get few flowers - this just isn't hellebore country and the lack of rain this year isn't helping matters any. I hope you get your early spring! Kris, I really admire your succulent collection,it's one thing we can't replicate up here. My hellebores are very dear to me. They get me through our rather gloomy and grey winters. I am finding that I might be able to plop 4 or 5 more in my new garden bed. Oh..the excitement!! I am so envious of your hellebores, especially 'Valerie'. They are way, way earlier than mine as well. And this year something is munching them! I've lost one huge clump, every single bloom, and a large flower spike off another. If I catch the perpetrator he will be dinner himself. Or herself. Probably. I started to call it "found space" but that would be a misnomer, with all of the work that went into claiming it. What fun you will have now. Space space space space....it's a beautiful thing! It looks SO good, you'll have fun filling that up! Glad you got help digging out those roots, it can be a week long project doing something of that scale. 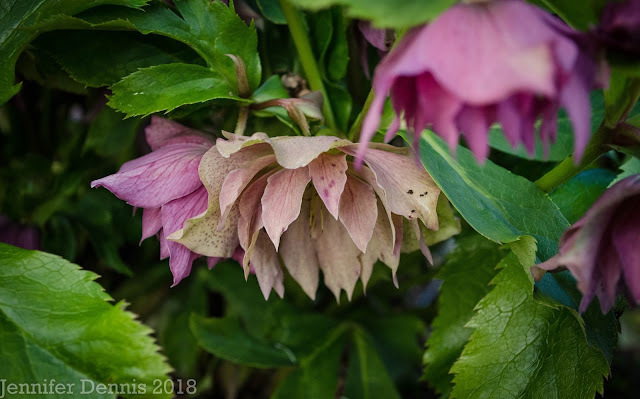 Great job, and nice hellebore photos! If your front garden is a postage stamp, mine is just a full-stop (I think you would call it a period - one of these .). The bed is looking good whatever Curly cat thinks. The Honeysuckles will be fill in quickly and look lovely ! I moved a bedraggled 'Harlequin ' to a new spot a few years ago , it's so much happier and has taken off . Often demolition can lead to new adventures and it's always fun to have a new space to plant. 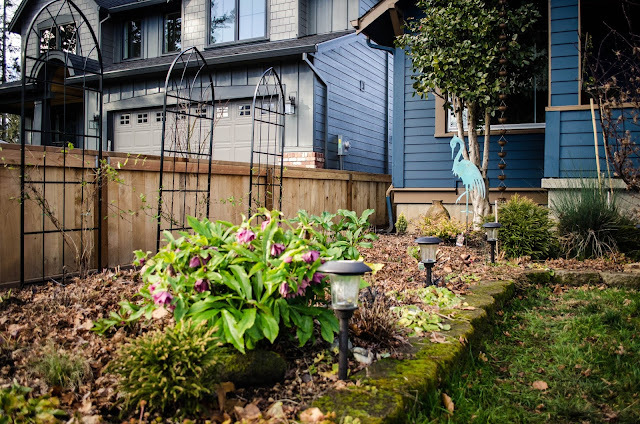 Your new area is looking great and plantings will really take off in the springtime. 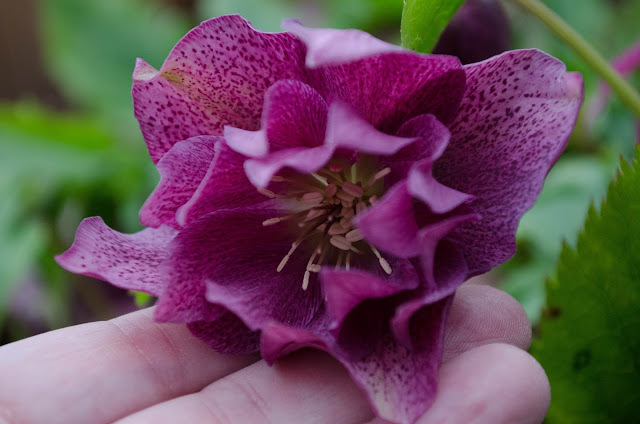 Your Hellebores are really gorgeous with so many blooms and should be happy in their new home. Happy Bloom Day!